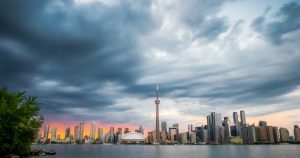 Recently, Toronto has been experiencing significant flooding in recent weeks due to summer storms that have packed driving winds and torrential downpours. It is anticipated that these types of weather events will become more of the norm rather than an aberration. And the risk of basement flooding becomes greater every year. 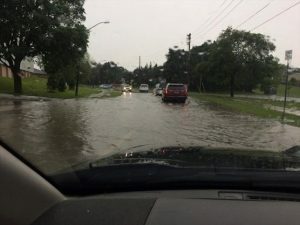 In fact, major insurers are now considering no longer offering basement flood insurance, (see our post earlier this year https://mapleleafmold.ca/what-to-do-befor…nd-after-a-flood/). So , here are things you should do if your basement floods and what can you do to prevent it from happening again. Basement floods do more than cause property damage: they can also pose a threat to you and your family members. If you wake up in the morning and come downstairs only to see that your basement is filled with water, call an electrician and the restoration pros at Maple Leaf Mold Inc. right away. If your circuit breaker is not located in the basement, shut off the power in your home. Otherwise, any electrical appliances or devices could become dangerous if they come into contact with the water. Your home’s circuit breaker is likely in a convenient location like the garage. If you have an older home, you could have a fuse box located outdoors by your meter. Once you’ve removed electronic devices or other items that were in harm’s way, it’s time to remove the water so you can assess the damage. If your basement is flooded, your sump pump has obviously failed, so you might need to purchase a new one and then use it to drain the water. A pump won’t remove all the water from your basement, so use a mop and towels to clean up the rest. If you find more than two feet of water in your basement, call Maple Leaf Mold Inc. to help you dry out the basement instead of attempting to remove the water yourself. It’s imperative that you remove the water as quickly as possible. The damp environment gives mold a chance to grow, and mold will only compound your property damage costs. If you want to effectively dry your basement, you can’t leave any wet items behind. Remove everything that got wet, from couches to bookshelves, and place them in an area where they can dry out, like the garage. Hopefully, your insurance company can compensate you for the damaged items and the cost of repairing the basement and removing mold. File an insurance claim as soon as possible after the flood. Along with removing wet objects, you should rip up the wet carpet. Sometimes the carpet is salvageable, but usually the carpet and the padding beneath it both need total replacement. Your basement won’t dry on its own. You’ll probably need to buy or rent fans or even industrial blowers. You can use a dehumidifier to remove excess moisture, help your basement dry faster, and minimise mold’s chances of growing. 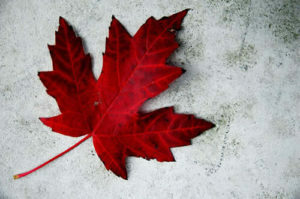 Maple Leaf Mold Inc. can provide these items to restore your basement. Damp, dark conditions allow mold to flourish. Mold can pose a health threat, and if you discover mold in the weeks after the flood, please call us to help you remove contaminated materials, disinfect and encapsulate. We’ll help by properly disinfecting and encapsulating areas to IICRC S520 standards, the best in the industry. Along with our dehumidifier and blowers, we can set up a HEPA air purifier that filters out mold spores and allergens. Check the basement every day after the flood, and keep an eye out for mold. If you see a suspicious-looking spot, call us. Also, take a look at the many blog posts we have on mold to learn more about what to be concerned about. After the flood happens, try to figure out what caused it in the first place. 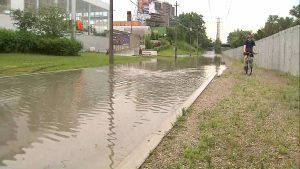 Did a heavy storm flood your lawn and drain into the basement? Do you have cracks in your foundation? Do you need to replace your sump pump or upgrade it to a newer model? Talk to a professional to learn how to update your basement, fix your foundation, or change your landscaping and gutters to prevent another flood. Basement floods are nothing if not annoying and costly, but once they happen, you can take steps to save your property and prevent future flooding.